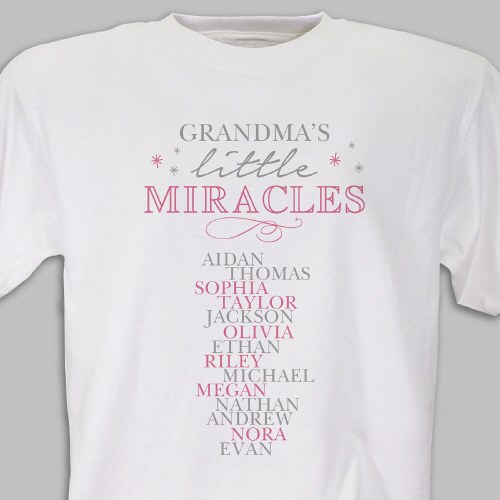 Grandma, mom or auntie will be so proud to display all her little miracles on these attractive personalized Grandma shirts. She’ll be thrilled to receive this personalized t-shirt on her birthday, Christmas, Mother’s Day or any occasion. This little miracles design is printed on our premium, 100% cotton, machine washable t-shirts. Available in adult sizes S-3XL. Free personalization of any title and up to 15 names is included. Please specify girl or boy after each name entered. 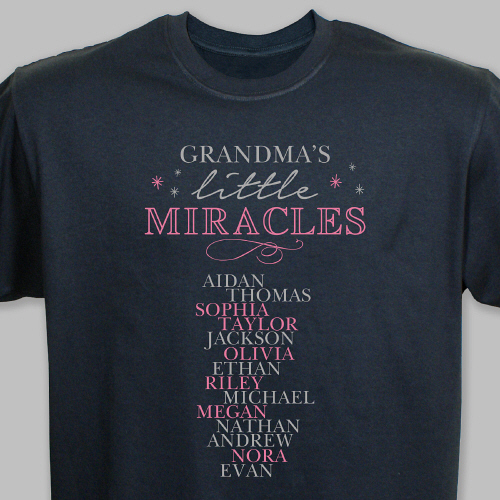 Additional Details Whether it's her children, grandchildren, nieces or nephews that are her little miracles, this personalized t-shirt is the ideal gift that lets her show them off. View our entire line of apparel for her to find more unique gift ideas.